While many ages and accretions of local beliefs found their way into what became known as the Thomasine community, and the foreign influences of other religions, this pure and deeply spiritual path to M’shikha (Christ) was almost entirely abandoned. It was under the influences of St. Sadhu Sundar Singh, a convert from the Sikh religion, that the idea of the original approach to devotion to M’shikha became more prominent. Sundar Singh’s influence is felt globally to this very day. Thomasines have also been influenced by Catholic traditions over the years, many of which they retain to this day, such as the use of the rosary, novena prayers, etc. It is this approach to the way of M’shikha that modern day Thomasines seek to embody. On regular days, we use the Liturgy of the Qurbana within the Didache. On High Holy Days we use the Liturgy of St. James the Righteous. Our Biblical canon is that of the Aramaic Scriptures known as the Peshitta, including the writings of St. Thomas and the Didache of the Apostles. The Absolute Head of the Assembly of Believers, the Church, is God the Father and Yeshua M’shikha. Under Yeshua is the chief of the Apostles’ successors – the Teacher of Righteousness, followed by our Bishop and Archdeacon. In our spiritual community we also have priests, deacons, and other pastoral offices of responsibility. There are also monks, nuns, hermits and anchorites. While we love the “Thomasine” or “Nasrani” Cross, the so called San Damiano Cross has become a cherished symbol wherever our community exists in the world due to its prominence in various revelations to the faithful of the Church. The Thomasine Community is officially known as the Mshikhani Province of Mar Thoma. 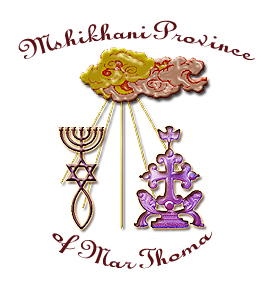 We are affiliated with the Assembly of Mshikhanim. Learn more about our beliefs by clicking here. Our monastics and hermits are under the spiritual guidance of Br. Joseph, who currently presides over the Monastic Order of Mshikhanim. All Thomasine monastics, hermits and anchorites look to Br. Joseph as their spiritual authority.